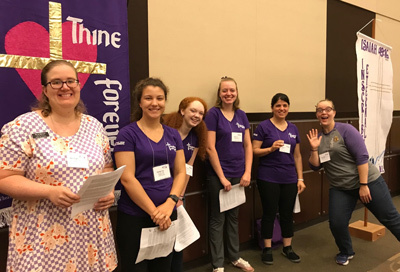 eNews 237: Busy Week for LWML Conventions! 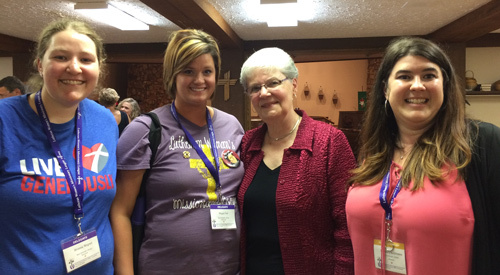 BUSY WEEK FOR LWML DISTRICT CONVENTIONS! Read Their Recaps and Highlights Here! 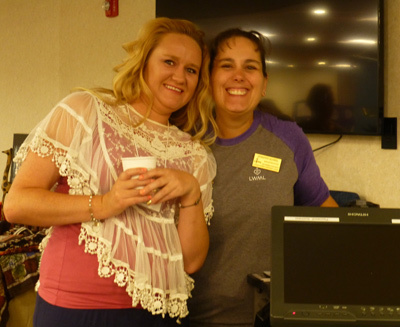 Laramie County Community College, Cheyenne, Wyo., was the setting for the LWML Wyoming District Convention, June 21–23, 2018. “No Other Name,” was the theme based on Acts 4:12, And there is salvation in no one else, for there is no other name under heaven given among men by which we must be saved. The opening worship service was held at Our Savior Lutheran Church, Cheyenne, WY. LWML Wyoming District President Danyne Six presided over the business meetings which included elections of officers and the approval of 11 mission grants totaling $35,000. Barbara Schaer was elected president for the next biennium. Rev. Jais Tinglud, Senior Pastoral Counselor led the convention Bible study. Mission speakers included Rev. Dr. Robert and Kristi Roegner of Apple of His Eye Mission Society, and Rev. Gregory and Rachel Sonnenschein of Wind River Reservation Lutheran Mission. Keynote speaker Shurie Scheel spoke on how important it is to, “Just Say YES!” when asked to tell others of His name. 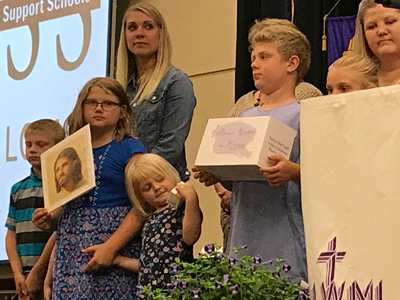 Attendees Walked in Grace as they participated in the mission goal pledge walk sponsored by the YWR Committee; and joyfully served in tying fleece blankets and stuffing backpacks for Wind River Lutheran Mission. Char Kroemer, LWML Vice President of Communication brought greetings from the LWML and was grateful for the opportunity to be a part of a God-blessed, Christ-centered, and Spirit-filled LWML Wyoming District Convention. 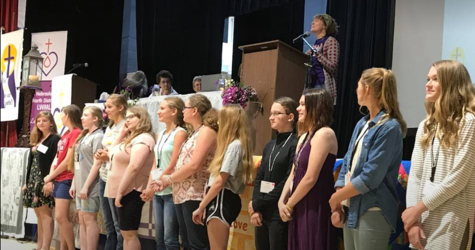 “His Light on Our Path,” was the enlightening theme of LWML Nebraska North District Convention, June 22–23, 2018, held at Nebraska Lutheran High School-Northeast, Norfolk, Neb. Julie Maaske joyfully led the singing. 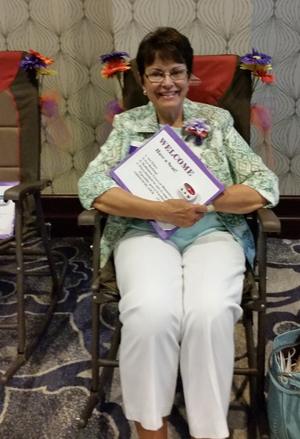 During the convention recesses, attendees participated in a “Rock-A-Thon for Mites” in which they gathered pledges based on the number of rocks made in the rocking chairs, number of handshakes and minutes spent rocking, and the number of carrots or cookies one ate while rocking. Beautiful handmade purple items delighted many during the “Purple Silent Auction.” Donna Pyle enlightened the participants during her keynote address. Words of greetings were delivered by LWML Nebraska South President Katy Gifford, Nebraska LLL President Dennis Wacker, and Rev. Dr. Brian Freidrich, President of Concordia University-Seward. Ten YWRs and 12 teens participated in the convention. LWML Vice President of Special Focus Ministries Kaye Wolff represented the LWML. Kaye stated, “I think we may have teen representation on the LWML Nebraska North District Board of Directors soon; the young women are working toward forming their own zone group.” LWML Nebraska North District President Crystal Miller presided over the business meeting that included election of officers and adoption of mission grants totaling $75,000. Lisa Stirtz was elected new president. 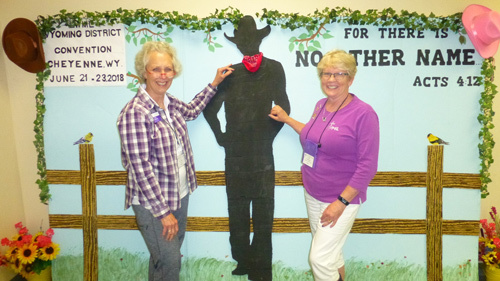 The women of the LWML North Dakota District joined together in convention at the Holiday Inn, Minot, N.D., June 22–24, 2018 proclaiming the theme, “Lift High the Name of Jesus,” based on Philippians 2:9–10, Therefore God has highly exalted him and bestowed on him the name that is above every name, so that at the name of Jesus ever knee should bow, in heaven and on earth and under the earth. 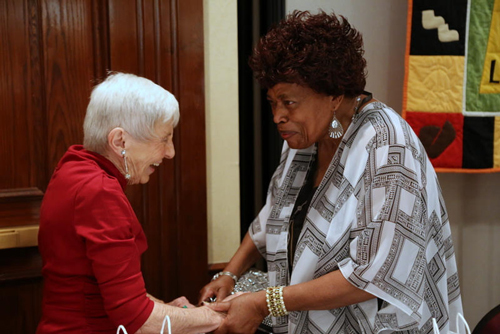 Past LWML President Jan Wendorf shared about her mission trip to Tanzania in her keynote address, sparking enthusiasm for mission support through our mites. Rev. Bernie Seter, pastor of three ND congregations and member of LCMS Board of Missions, shared his mission field experiences. 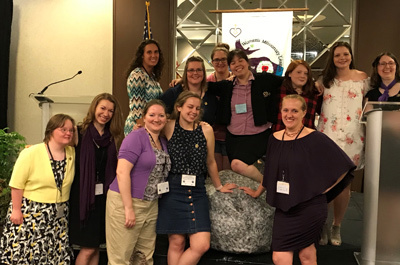 Saturday night’s banquet celebrated the National LWML 75th Anniversary with some favorite memories from Past LWML ND District Pastoral Counselors Rev. Dr. Larry Harvala and Rev. Bernhard Seter. Various ingathering items were provided for the summer activities of the Dakota Boys and Girls Ranch; personal care products were gathered for the Domestic Violence Crisis Center; and baby items were gathered for the Dakota Hope Clinic. Servant activities included putting together Mercy meal packets, folding Dakota Boys and Girls Ranch newsletters, or packing the ingathering items. Convention offerings were collected and earmarked for LWML ND District and LWML national mission grants; Wittenburg Chapel in Grand Forks, ND, a ministry of the LCMS ND District; and support of Nichelle Dykema, serving our Lord through the LCMS in Lima, Peru. LWML ND District President Valerie Biberdorf presided over the business meeting that included the election of officers and the selection of mission grants totaling $76,750. Bringing LWML greetings was LWML Treasurer Marilyn Schroeder. 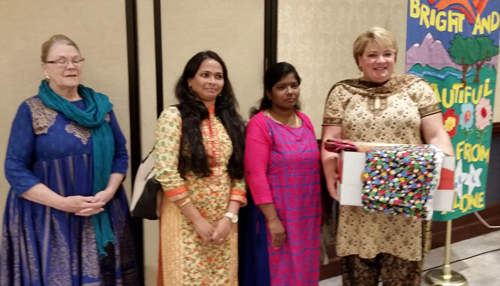 LWML Ohio District gathered June 22–24, at the Marriott Columbus Northwest Hotel in Dublin, Ohio. The convention theme, “Walk in the Light,” was based on 1 John 1:7, But if we walk in the light, as he is in the light, we have fellowship with one another, and the blood of Jesus his Son cleanses us from all sin. Rev. Donald Beaumont served as Proclaimer at the Friday evening worship service; Mrs. Amy Rast and Rev. Dr. Lawrence Rast, President of Concordia Theological Seminary Ft. Wayne delivered the keynote address; Rev. Ryan Peterson, Campus Pastor at Concordia University, Ann Arbor, Mich., served as Bible study leader; and Elaine Bickel, Christian author and humorist, brought tears of laughter and smiles of joy. LWML Vice President of Gospel Outreach Angelina Jauregui brought greetings. LWML Ohio District President Jeanne Schimmelmann presided over the convention business which included selection of mission grants and election of new officers. Three offerings were collected to benefit, 1) the $85,000 mission goal; 2) Reaping the Harvest Ministries which recently organized a new LWML society with fifteen members who serve the Lord with gladness; and 3) LCMS Response Plan supporting hurricane victims in Puerto Rico. 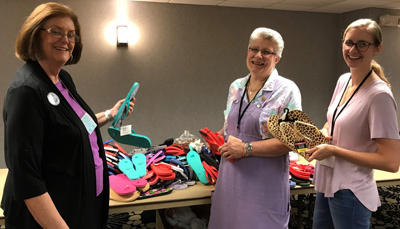 LWML Ohio District Human Care Committee provided two ingathering opportunities to help victims and pastors throughout the disaster areas and to help homeless women in a shelter of Lutheran Social Services in Columbus, Ohio. Interest sessions were presented by Rev. Charles, St-Onge Area Facilitator for Latin American and Caribbean LCMS World Missions; LWML Ohio District Christian Life Committee and Structure Committee; Dr. Phillip Giessler, missionary to seven African countries and Cuenca, Ecuador; and LWML Ohio District Junior Counselor Rev. Daniel Herb. Servant activities included assembling coloring packets for hospitalized children; making bookmarks to be placed in small Bibles for the homeless through the LSS Faith Mission in Columbus; and giving blood to the American Red Cross.